Tired of carrying around your bulky key ring? 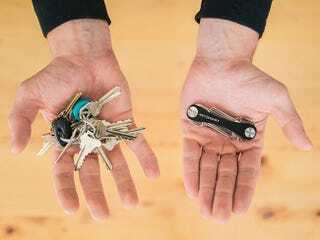 Check out KeySmart 2.0 - it's a slim and lightweight key organizer that lets you attach up to 10 keys in one compact unit. Right now, Jalopnik readers can grab one for 26% off - just $16.99 + free shipping. KeySmart is crafted from aircraft aluminum and stainless steel, so it's durable and lightweight. Its design is inspired by Swiss Army knives, so you can rotate and easily switch between keys that you're not using. It's small - about the length of a stick of gum - but you can fit up to 10 standard keys. Interested? Grab your Keysmart at the link below.